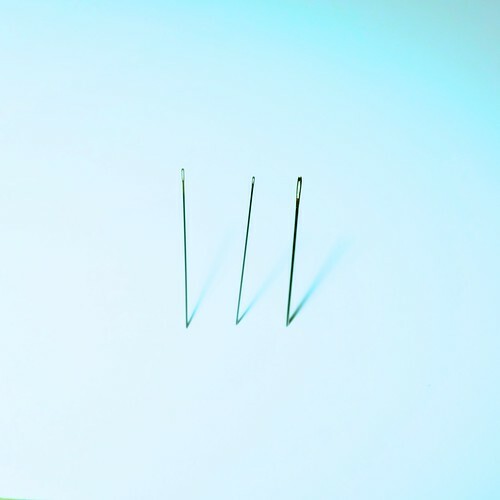 write / sew / live - Penny Poppleton - Thread & Needles. 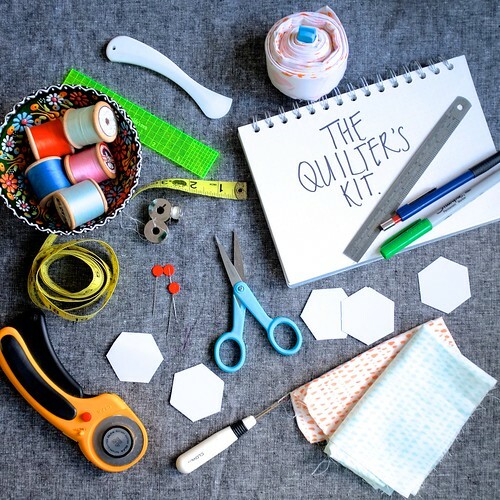 I have promising to talk about what kind of thread I use for yonks, and what better way to kick off the inaugural post of The Quilter's Kit than with a discussion about one of few things you literally cannot sew without: thread & needles. 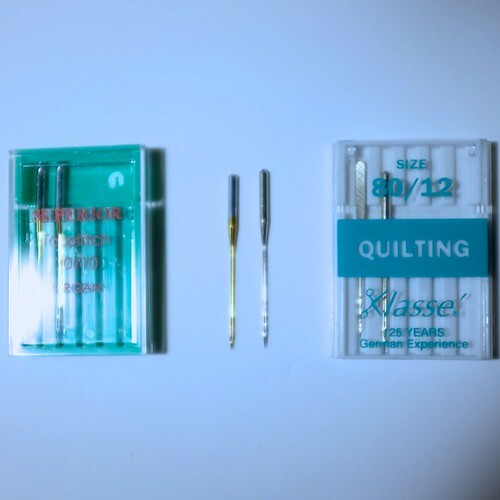 This is a quick overview of the needles and thread I use the absolute most. 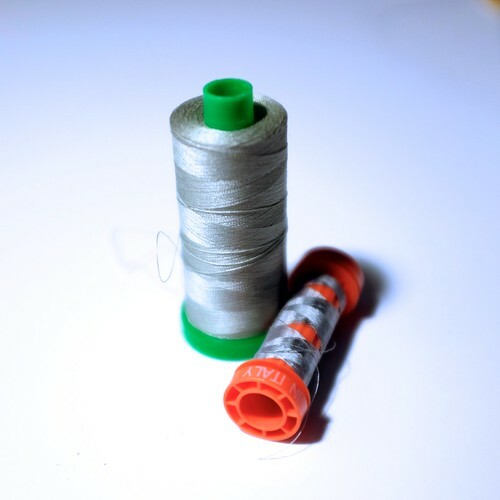 I use Aurifil Cotton Mako for most of my machine and hand work. I like it because it's not linty and it doesn't break or fray. I'm a miser at heart, so I don't like it when my recommended 18" of thread frays before its time. Aurifil doesn't do the fray thing. It also cuts cleanly, like when you need to unsew. We've all been there, and it's no fun picking bits of cruddy, linty thread out of a seam. Amy Badskirt wrote more about that here. You can see many different kinds of thread under a microscope here. And another great, in-depth review can be found here. If you're worried about how it goes on a Bernina, there's a handy video here! 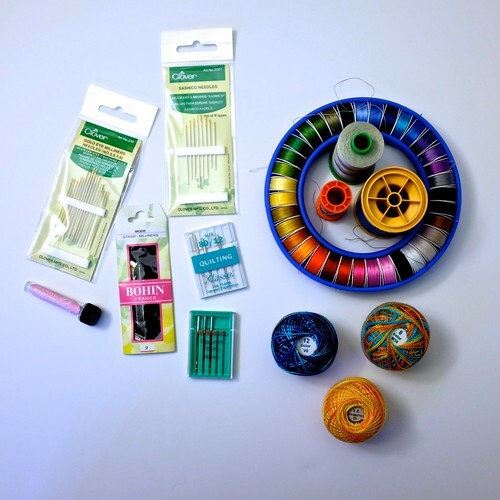 I'd like to take this opportunity to point out that Aurifil 50wt can be bought for a 1300m spool for $13 at my local quilt shop...making it the most economic thread on the market. And you get more on the bobbin, which means less stopping mid-seam! 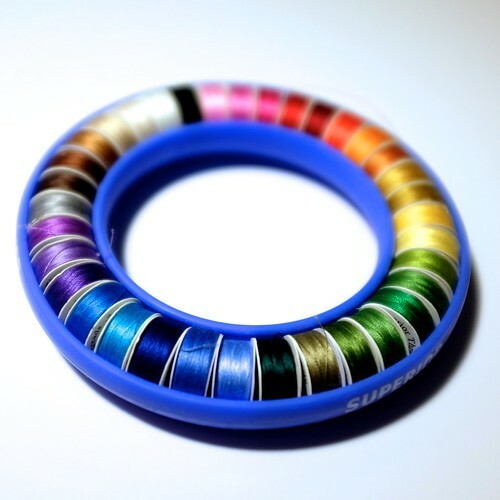 Another thing I have on hand for handwork is this handy little Superior Threads Donut. It's a great rainbow of threads and it works for applique and piecing together tiny handwork of different colors. 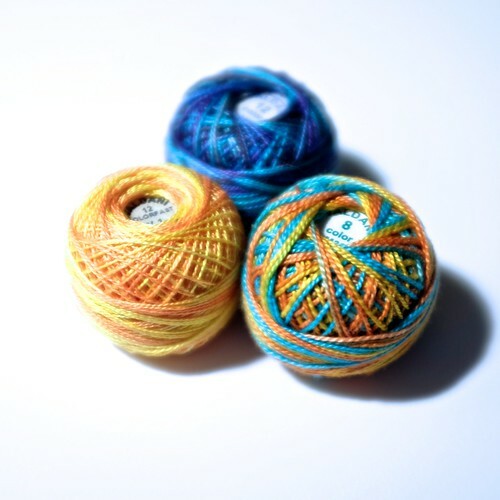 So far I like it slightly less than Aurifil, but until they get a donut, short of winding bobbins from my exisiting spools, I will be taking the Superior donut around in a pinch. I love to hand-quilt, but I am not a "traditional" 13 stitches to the inch hand-quilter. I'd go blind or crazy! I prefer to perle quilt, which is sometimes (derisively) called "big stitch quilting" because of the larger stitches used. I think perle quilting is absolutely beautiful, and my favorite perle cotton is Valdani 12wt. I will use 8wt but I prefer the slightly finer 12wt - I'm a touch arthritic so less thread to tug through three or more layers is better. A while ago I was a fierce Klassé evangelist. They are reasonably solid needles; the only problem is they break like crazy and blunt like the dickens. (So they are normal sewing maching needles, basically.) I'm religious about changing my needle (every two bobbins, or every time it starts to "punch" the fabric) so I was going through... four or five a week, sometimes. Yikes. Then I was tipped off to the wonderful Superior Topstitch needle. I use the pink packet (90/14) for quilting on my Juki and the blue packet (80/12) for piecing on my Bernina. And apart from the fact that they needles are extremely hard to break (they bend, but no bits flying off at your eyeballs), the eye is huge, so even a blind-as-a-bat like myself can thread them. This is the worst picture in the history of the world, so please just read the infographic. Bohin's Milliners Size 9 - these are my crowbars. Perfect for basting hexies and handsewing seams, my only compaint is that the eye is a bit small, making it hard to thread on buses, airplanes, while Mr Poppleton is driving, etc. These I don't mind giving to starting sewists - they're strong and sturdy, but are still capable of fine work. Clover Sashiko Needles - I use sashiko needles for perle quilting as they're long, sharp, fat in the middle (making the passage of thread easier, which places less stress on the thread causing it to fray less), and reasonably easy to thread. I hope you found this helpful, and of course I'd love to hear what you use!